Hart to Heart Transportation is recognized as the tri-state leader in the safe and dignified transport of obese or “bariatric” patients. Our goal is to provide the best preeminent care in customer service on all levels including bariatric transport. In recognizing the significant increase in bariatric patients and the limited resources in providing these specific services, as an industry leader, Hart to Heart continues to evaluate and purchase state-of-the-art equipment, such as Ferno’s POWERflexx fully electronic stretcher for bariatric patients. 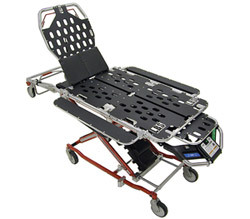 This hydraulic stretcher, complete with unique Lateral Body System (commonly referred to as LBS JR) increases the width of a standard stretcher to accommodate larger patients lifting up to 700lbs with no manual assistance. Folding “wings” reduce the LBS JR profile for better maneuverability through doorways. The wider platform allows patients to comfortably rest while accommodating much more body mass and all unique bariatric needs, whether the extra body mass is in the upper or lower extremity. Hart to Heart believes all bariatric transports should be completed in a safe, professional and dignified manner, and the LBS JR enables us to achieve this standard. Evaluating bariatric patients requires several processes to ensure a safe transfer with no complications impacting patient care. Make a site visit to the hospital, facility, or residence to assess the patient and the patient’s needs and determine appropriate resources and equipment required for a safe transport and for the comfort of the patient. Conduct an assessment and survey the patient’s residence or care facility destination to ensure all entrances are accessible and able to accommodate the bariatric LBS JR for doorways, hallways and other areas included in the patient’s transport. Arrive at the hospital or facility fully prepared with the appropriate number of staff to transfer the patient in a safe and professional manner. All patients with weight ranges between 500 and 700lbs will have six to eight EMT technicians with an on-site supervisor monitoring all interactions for patient and crew safety. Since our first purchase of the Ferno POWERflexx stretcher in early 2000, we continue to evaluate for improvements to capitalize on the advances in technology with power stretchers. Through our commitment, Hart to Heart has developed the reputation as a first-class leader for providing bariatric services in a very safe, professional and dignified manner. Hart to Heart continues to emphasize the safety of the patient and crew as its first and foremost priority for our clients and patients that we proudly serve. While our specially equipped bariatric ambulances are impressive, equally important are the highly trained crew members that are familiar with the unique issues that bariatric patients experience, including the need for care with privacy and respect, as well as the on-site supervision provided during transport.